Penn Engineering continues to build on its existing strengths in materials, micro-electro-mechanical systems, microfluidics and nanofabrication. 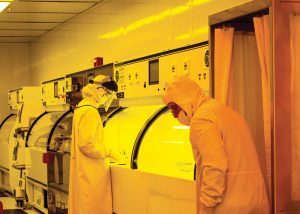 State-of-the-art facilities in nanotechnology have positioned Penn Engineering to become a hub for excellence in the industry-rich mid-Atlantic region and provide a nano “maker-space” for the greater Philadelphia area. There are new and exciting opportunities in nanomaterials, including characterization, microscopy and scalable approaches to synthesis; and in nanodevices, including the design and integration of nanosystems with applications to information technology, healthcare, robotics and manufacturing.